An Ultra Premium Lean Muscle And Lean Mass Gainer! TRUE-MASS® is an ultra-premium lean mass gainer, designed to promote muscle growth. It features BSN®’s signature ultra-premium protein formula to feed an athlete’s muscles with essential protein building blocks. The unique carbohydrate blend provides the caloric support necessitated by extreme physical exertion, helping the body prepare for and support recovery from intense training. Healthy fats supply quick-burning fuel to satisfy the serious athlete’s energy demands. And all these high-quality ingredients come delivered with BSN®’s exclusive flavor technology, producing one of the most mouth-watering mass-gaining shakes on the market. TRUE-MASS®’s balanced composition makes it a nutritious source of caloric support and useful as a healthy meal replacement as part of a balanced diet plan. Its ultra-premium blend of protein, carbohydrates and healthy fats promotes increases in lean muscle mass. 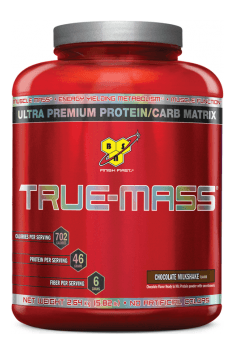 And with a taste that can’t be matched, when it comes to mass gainers, TRUE-MASS® is in a class by itself. Przepysznie smakuje i bardzo dobrze się rozpuszcza! Napewno jeden z Najlepszych gainerów na rynku. One portion (100-150g) immediately after a workout and the other (100-150g) during the longest break between meals. One portion (100-150g) in the morning or around noon, the second (100-150g) during the longest break between meals. The supplement is recommended especially for athletes who have a problem with building or maintaining muscle mass. Number of daily portions and their size will depend on shortages or energy needs of individual diets. It should be used after exercise to replenish depleted glycogen stores and deliver high-quality protein. Carbohydrate - protein supplements are perfect for people who are busy, lazy or have increased energy needs, and are a great substitute for a balanced meal. Consumption of milk with a high fat content also increases the energy value and the amount of protein per portion. BSN is an experienced manufacturer of nutritional supplements and diet supplements for athletes. These products include amino acid products, testosterone boosters, fat reducers, supplements stimulating the production of nitric oxide, protein and carbohydrate-protein supplements. The offer also includes gainers and pre-workout supplements. A powerful prohormone. Designed to increase both muscle mass and strength. Complex of vitamins and minerals with a high content of vitamin D. Supports immune system and strengthens the body. The Most Potent Estogen Contol Supplement Available!